Intervertebral discs are gel-like structures surrounded by a tough fibrous layer of connective tissue and strategically placed in-between the vertebrae to act as shock absorbers and facilitate movement of the spine. Over time, the discs loose their shock-absorbing capability and gradually reduce in height due to a lack of fluid within. This leads to small tears within the outer layer (the annulus fibrosus), causing the gel-like inner component (the nucleus polposus) to bulge. Thus, ‘slipped disc’ is actually a misnomer and the terms ‘disc-herniation’ or ‘disc-prolapse’ are more frequently, and certainly more accurately, used. A disc prolapse tends to bulge towards the posterior-lateral aspect of the joint, pressing on the nerves of the spine causing tingling, numbness, pain or power loss in the arms or legs depending on whether the problem is in the neck or low back. Standing, sitting, walking, sneezing, coughing and bowel movements can be difficult and on occasion, a severe prolapse can press on the spinal cord causing compression, which requires urgent medical attention. Osteopaths are trained to recognise any of these signs and refer for onward management where appropriate. A disc herniation may also be caused by trauma or sports-related injury, making it most common in people between the ages of 30-50 with a male to female ratio of almost 2:1! These injuries usually occur at the lower lumbar spine (L4/S1 and L5/S1) and disc herniation above these levels are most commonly seen in persons over the age of 55. 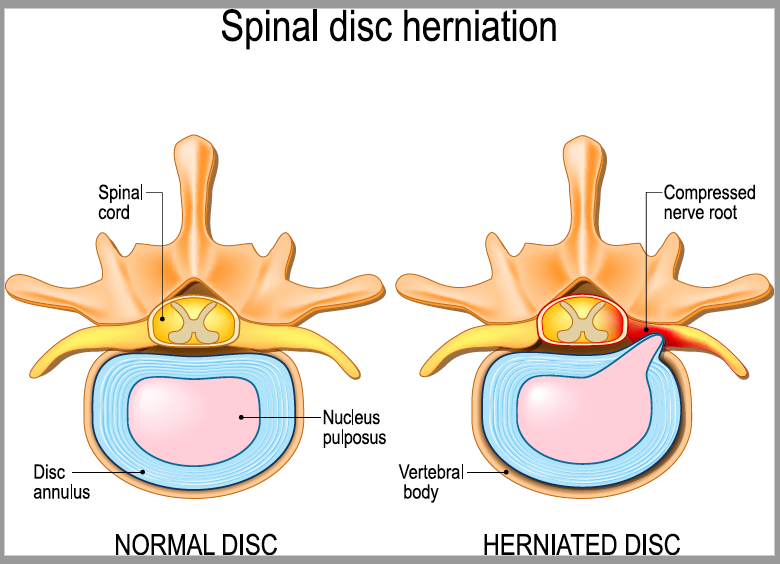 A disc herniation is usually graded between 1-4 dependant upon the extent of the protrusion and damage to neighbouring structures. However, all disc related injuries will require time to fully heal. A combination of self-management techniques, usually involving specific exercises and stretching regimes, with a course of manual manipulative therapy will achieve the best results. Rarely, does a disc injury require surgery, however, where protrusions occur frequently or cause debilitating pain and dysfunction, it may be considered. Your osteopath will assess the severity of your condition on an ongoing basis and refer for alternative management where appropriate.